Are you looking to generate more seller leads? Our real estate Home Valuation page is the easiest, quickest, and most cost-effective method of generating quality seller leads. This means more listings for you! 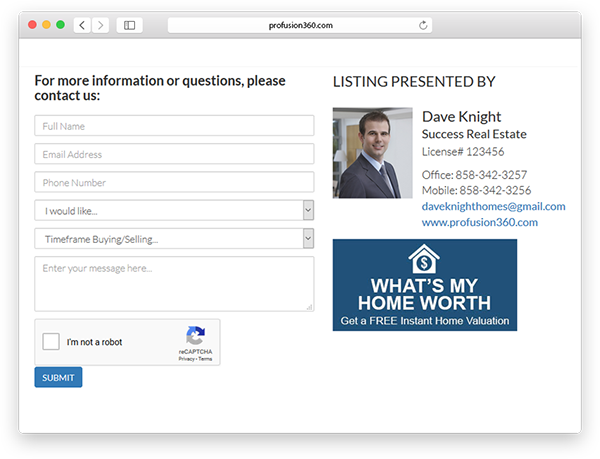 Your lead capturing Home Valuation landing page can be used practically anywhere. 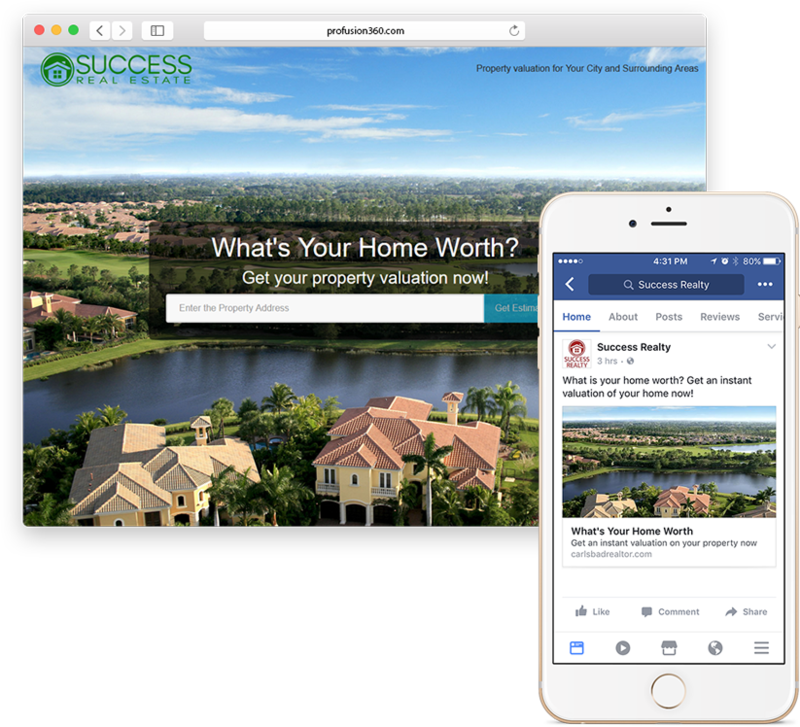 With our one-click social sharing tool, you’ll be able to post your Home Valuation landing page to Facebook and other social media websites where you’ll be able to drive traffic to the Home Valuation page and capture more leads. Our Home Valuation page is completely responsive and mobile friendly so it can be viewed on any device whether it’s a tablet or mobile phone. Our real estate Home Valuation page is also seamlessly integrated into your real estate website.The Home Valuation page will be seen by all your website visitors making it another source of capturing seller leads. 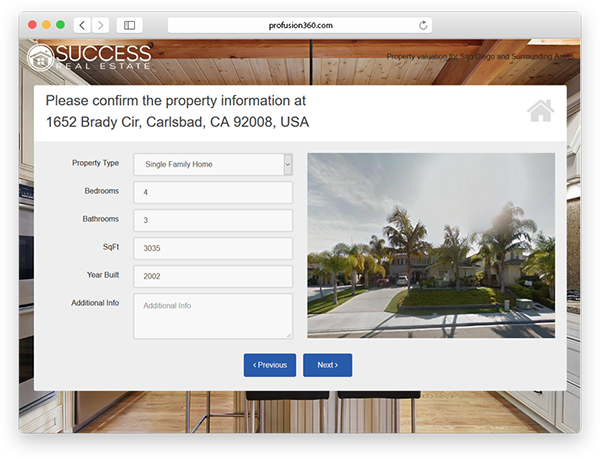 Our real estate Home Valuation landing page is integrated perfectly with our CRM system. Any leads generated from the landing page are captured in real-time by our CRM system. When you receive a lead, you are notified instantly through email and text message so you may contact the lead immediately. 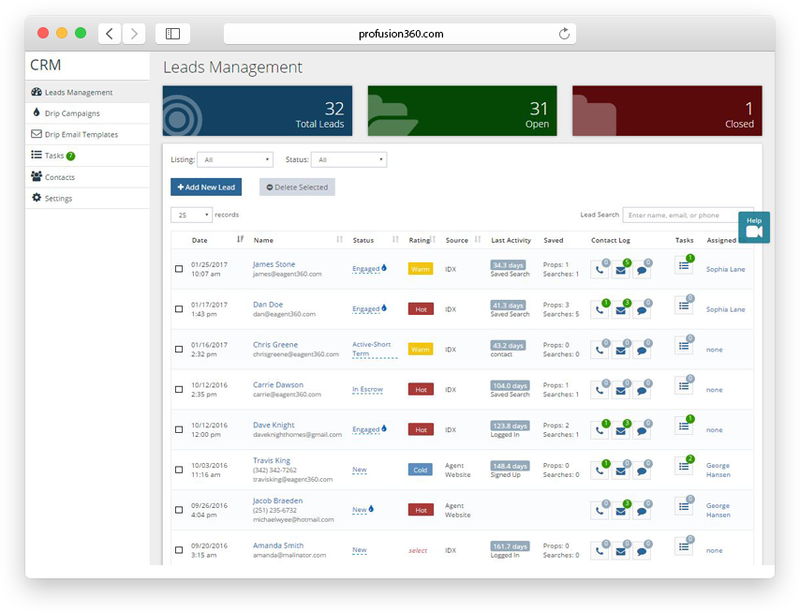 Within our CRM system, you can then manage your leads and assign automatic follow-up emails to your seller leads. Using our special tracking links, you will know the source of your seller leads. Whether the lead comes from your real estate website or Facebook, you’ll know the source of the lead so you can measure performance of your campaigns. Our real estate Home Valuation page will give the user an instant property valuation based on historical data. Valuation include current estimate, low estimate, high estimate, and 30-day change. An instant valuation will give you more credibility and a starting point to contact the user for a more accurate property valuation based on additional factors. The valuation report along with the user’s contact information is captured within our CRM system so you know what valuation was given to the user. It is vital that you are able to deliver a home valuation to the user as quick as possible. If the process is time consuming or complex, you will lose leads. 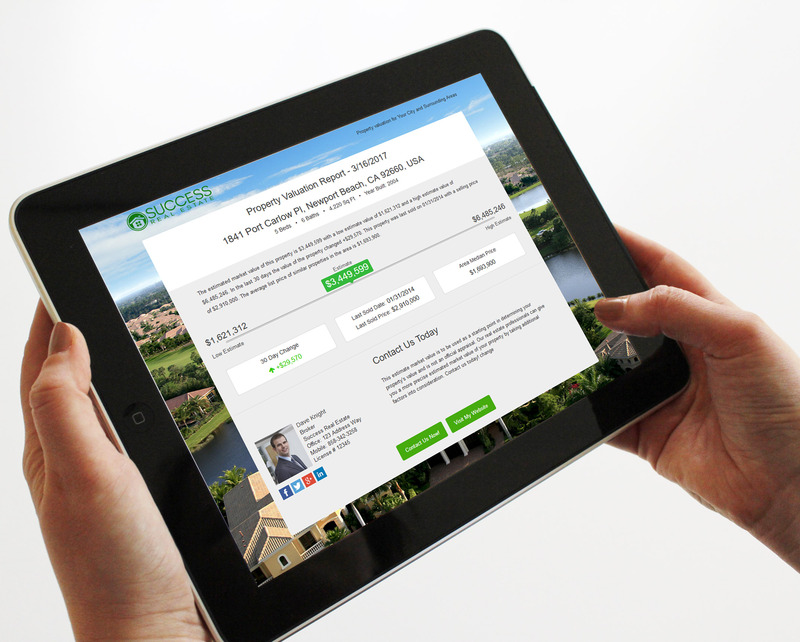 Our home valuation landing pages are super user-friendly and quickly deliver results to the user. Our platform will automatically populate the property information fields, and a photo of the inputed property is even provided for confirmation. This gives the user a better overall experience which can significantly increase your lead capture rate. 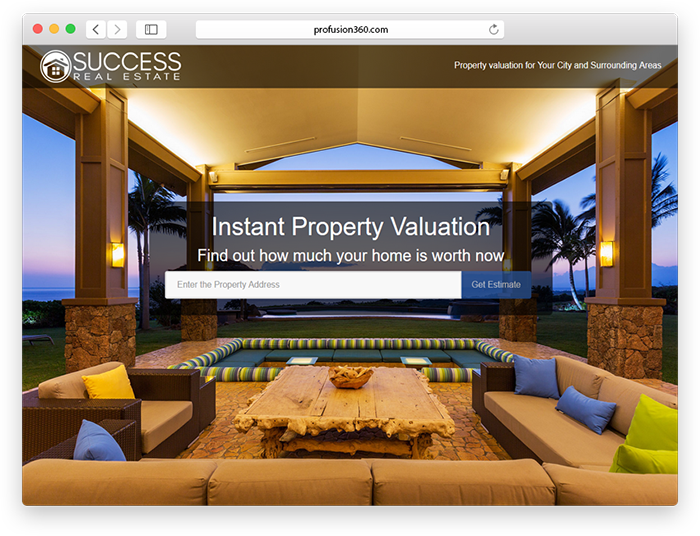 Your home valuation landing pages exist on the custom domain of your real estate website. However, there are times you may want to give a home valuation landing page its own custom domain and operate separately from your real estate website. For example, if you are focusing on home owners in the Rancho Santa Fe area, you may give your home valuation landing page a custom domain name that stands out such as www.RanchoSantaFeHomePrices.com. 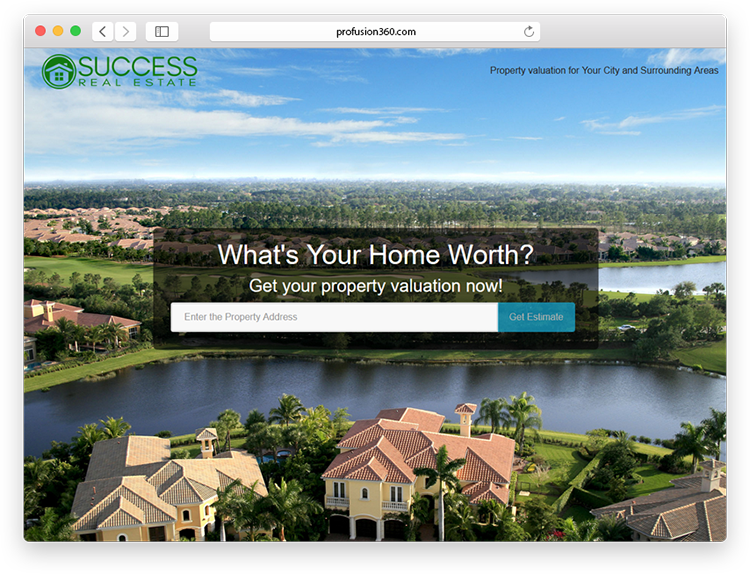 This home valuation landing page can now be marketed separately from your real estate website. Like all of our products, the Home Valuation Page is automatically generated for you and ready to use. However, your Home Valuation Page is customizable in many ways including the design, text, and background image. Customize the look and text of the Home Valuation Page and tailor it to your area and requirements. With our integrated marketing platform, your instant home value landing page will be integrated right within your real estate website working seamlessly together to generate buyer and seller leads. On top of that, all of your property websites will have a link to the home value landing page. This gives you the opportunity to capture both buyer and seller leads when you are marketing your property websites whether it’s online or offline. Questions about our Home Valuation Landing Pages?